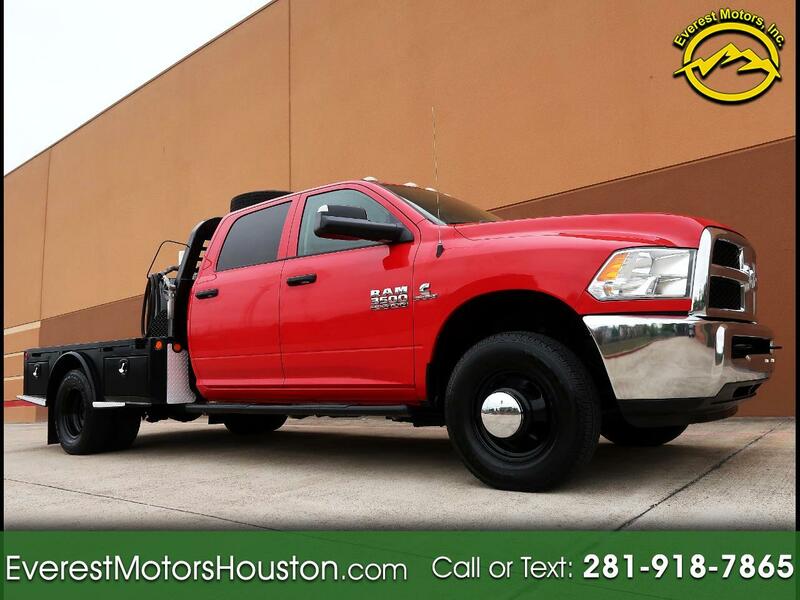 Used 2015 Dodge Ram 3500 TRADESMAN CREW CHASSIS AND CAB 4WD DRW AISIN TRANS for Sale in Houston TX 77063 Everest Motors Inc.
AISIN Automatic Transmission, 6cyl 6.7L Cummins Turbo Diesel engine, TRADESMAN Package, Air Conditioning, 3.73 Rear Axle Ratio, 4X4 Package, Cold Weather Package, Engine Block Heater, Cruise Control, Premium Aftermarket AM/FM Player W/Aux Input, AISIN 6-Speed Automatic transmission, Headrest DVD Player, 6 Seater With Fold Down Center Console, Traction Control, Exhaust Brake, Factory Brake Controller, Power Windows, Tachometer, Gooseneck, Trip Computer, Premium 17 Inch Wheels, Power Steering, 12V Power Outlet, Intermittent Wipers, Power Door Locks, Auxiliary Fuel Tank, Power Adjustable Side Towing Heated Mirrors, Dual Air bags, Tinted Glass, Tilt Steering Wheel, Running Boards, Clearance Lights, Four Wheel Drive, Six Matching LT235/80R17 Tires in Very Good Shape and Much More... Flat bed measures approximately 114" Long 89" Wide! This very sharp looking, and hard to find 6.7L truck is in Great condition inside and out, with 6.7L Cummins Turbo Diesel engine paired only with the tough new AISIN 6-Speed Automatic transmission. Best-in-class available torque and horsepower, These trucks have the most towing capacity and 3.73 Rear Axle Ratio; you can tow a train with this truck! These trucks have the most towing capacity. Engine Runs super strong with no smoke or blow by!!!. This 6.7L truck runs and drives Great! All the power equipment and gauges operate Great! Exterior color is in Great condition with no major ding, dent or scratches, However you might find a few scratches here and there as you would expect on any used vehicle. small rock chip on windshield, front of the hood and driver side rear door (Please See The Last 3 Photos). Interior as shown in the pictures, is in Great condition. Seats are very clean with no tear or wear. Headliner is specially clean! Six Matching LT235/80R17 Tires in Very Good Shape. This nice Crew Cab truck comes with One Combo Key W/Remote, Books, Owner's Manual!!! If you are looking for an Great condition 6.7L Crew Cab Dodge Ram 3500 Flat Bed in the market, don't miss the chance to own this beautiful 4X4 Ram. All our vehicles are sold AS IS with no warranty.